Joe rounds off his series of guest lessons by playing licks in the style of two of his greatest heroes, Paul Kossoff and Eric Johnson. 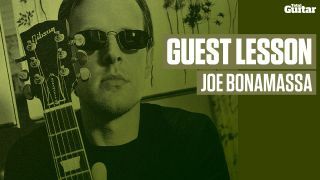 Check out the video above to watch Joe Bonamassa's guest lesson for Total Guitar issue 218 (on sale 5 August to 1 September) and pick up the mag for for the accompanying tab and explanation. In addition to at least four full tabs of classic and contemporary songs from your favourite artists, every issue of TG features guest lessons, technique focus lessons (to explain the more complex areas of the tab) and a Riff Of The Month video lesson for the more visually orientated learners among you. Each issue also includes the story behind the songs, clearly explained amp and effects settings and backing tracks for all of our lessons . See below for more information.